The record $13 billion settlement agreed to by JPMorgan Chase and the Justice Department on Tuesday brought back into the news the story of the sales of securities based on troubled mortgages by Chase and other financial institutions that led to the economic meltdown of 2008. But while those companies were blamed by many for the fiscal crisis, Americans have mixed feelings about how far government should go in regulating the industry. A Pew Research Center survey conducted in September found that 49% of the public believed the government has not gone far enough in regulating financial institutions and the markets. Nearly as many (43%) believed the government had gone too far. The survey did not specify whether “regulation” meant congressional action, like the controversial Dodd-Frank law that was enacted in 2010 after the financial crisis, or enforcement actions such as the JPMorgan settlement, or both. There is substantial disagreement between Democrats and Republicans on the question. (The Republican-controlled House voted last month to repeal a key provision of Dodd-Frank that prohibited banks from trading for their own gain). 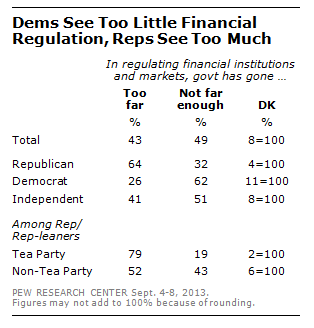 About two-thirds (64%) of Republicans said government regulation has gone too far compared with 62% of Democrats who said it had not gone far enough. Our past surveys have shown that government regulation of business in general has become one of the nation’s most divisive issues. In nearly every political values survey since 1987, majorities have agreed that “government regulation of business usually does more harm than good.” In a 2012 survey, 76% of Republicans took that position while just 41% of Democrats agreed. When it comes to blame for the 2008 financial crisis and the recession that followed, another other survey from 2012 found that among adults who said it was more difficult than a decade ago to maintain their standard of living, 57% said “a lot” of the blame lied with banks and financial institutions. The only institution that drew more blame was Congress, with 64% pointing the finger at Capitol Hill.